It’s 8.30am, I’ve already been up for over three hours, attending an Anzac Day function and now I’m at home with the day ahead of me to enjoy. It truly has become a commemoration day for all New Zealanders, for descendants of all people touched by war. 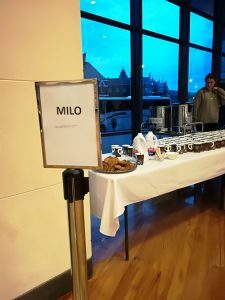 I was on Milo duty with a teenager at Tōitu Otago Settlers’ Museum, serving up hot Milo and Anzac biscuits to people after the service. Not so many people came in this year; the weather was mild and people wanted to get on with their day. The mix of people coming in was still striking, though – politicians, servicemen, choristers, families, teenagers in school uniform, tourists … the list goes on. People drawn together to remember the past and to share in the moment. Kei wareware tātou : Lest we forget.